If it feels good, just do it. Start by placing this ergonomic support shim where needed. It's time for you to just say NO to numbness of the legs or lower back discomfort while kayaking. Cloud10 Gear is made in USA quality. Sun proof durable and breathable material does not absorb water. A cooler is just a cooler until you add our X-Wide Multi-Use Chair. 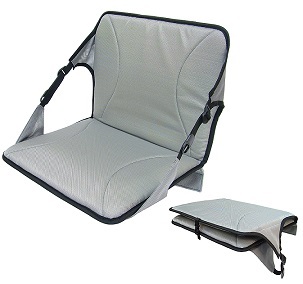 Then it becomes a comfortable seat with a place to attach our storage options. Cloud 10 comfort with a royal touch. Fold the back of seat forward for an extra plush 2.5 cushion or tip it back to transform the cushion into your throne for the day. A simple comfort solution for a more comfortable kayak seat, canoe seat, or a stump, log, rock, stand-up paddle board, or wherever you'd like a comfortable place to sit. Don't let your worn out back band wear out your back. Replace it with a Cloud10 kayak back band and get your happy on. Convert any old kayak seat into the most comfortable you've ever paddled. No tools required. Drop this new comfy seat one over the old hard seat. 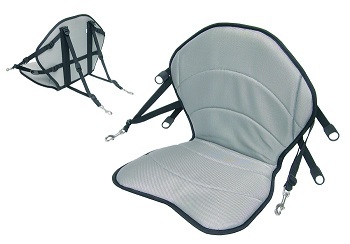 Fits virtually all sit-on-top kayak models, and replaces existing, uncomfortable sit-on-top kayak seats. If you love to fish from your kayak but your old sit-on-top kayak seat isn't loving you; tip back in your new High-Back Sportsman Seat and just go fish.